As the year moves on there is excitement in the air. Birds are chirping, flowers blooming, and second-year medical students are getting ready for clinical rotations. There are many ways to be a terrible student on rotations, but terribleness should probably be avoided. A better plan involves learning some methods of being a good clinical student. I’ll share some hints. 2. Encourage and accept constructive criticism: No one likes being told “you’re doing it wrong” but sometimes it is the best way to learn. Actively ask for suggestions on how to improve. 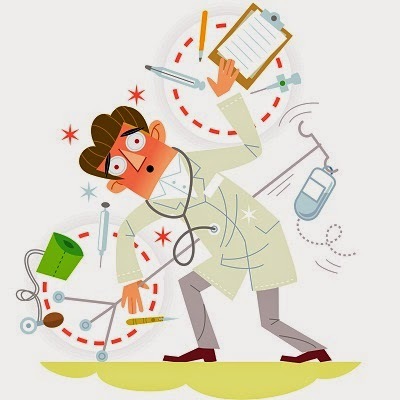 It is much better to mess-up on rotations, while being closely supervised, than during or after residency. Rotations are your time to make a mistake — accept that, learn from it, and become a stronger clinician. 4. Laziness: The lazy medical student sticks out like a dislocated digit. Make sure you’ve done everything that is expected of you (and more) before taking a nap, texting, or engaging in online shoe shopping. Better yet, wait until you get home to do those things. 5. It’s a small world: Everyone knows everyone in medicine. The nurse who annoyed you today could be golfing with the program director of your top-choice residency tomorrow. You can use that to your advantage, or your detriment. Be nice. Make sure to approach problems or concerns professionally, rather than getting emotional or defensive. From patients to housekeeping staff, pretend everyone is grading you. Paranoid yet? Good. 6. Know your patients: Medical students typically only carry a few patients at a time. Learn everything you can about your patients. Know the vitals, test results, and history. If you have short-term memory issues, write it down. Be able to quickly regurgitate this information during rounds or while presenting the patient. 7. Assessment and plan: You’ve made it through the tough part of medical school, so you’re probably fairly smart — but can you apply that knowledge? During rotations this will be “tested” in your ability to form a reasonable differential diagnosis and basic assessment and treatment plan. Before presenting to your resident or attending sit down for a minute, take a deep breath, and come up with at least three or four differentials. Think about how you would work-up the patient and specifically why you want certain tests. 8. Ask for help: If your patient looks sick, tell your resident/attending! If you are uncomfortable or unsure, ask! Asking a stupid question is much better than doing a stupid something. Stupidity kills … literally. Learn your limitations and accept the fact that you can’t know everything. Medicine is a team sport, use your team. 9. Stock your coat: Certain items are always needed but often hard to find in the hospital. Always carry an extra pen, a small roll of tape, alcohol preps, gauze pad, scissors, and a penlight in your freshly-deodorized coat. Vary these items to your rotation. You, or someone else (i.e., your attending), will often need these items. Instantly providing the urgently needed scissors or finger lubricant will make you a trauma-bay rock-star. 10. Prepare early: First or second year medical students can start preparing early for rotations. Use online resources available through AAEM, EMRA, and SAEM. Do some clinical shadowing. Find a mentor. Work with your school’s emergency medicine interest group/club to plan some practical clinical skills labs (with medical simulators, if possible). Focus on learning the basic procedures that medical students are expected to perform (such as suturing, IVs, NG tubes, and CPR), rather than the advanced procedures (central lines, chest tubes, pericardiocentesis) that you will likely not be performing much as a student. Becoming proficient in basic procedures can help you earn respect from preceptors, often leading to opportunities for more advanced procedures. Congratulations, you are now armed with a few tools to do well on rotations. Keep your eyes open. At some point you will see the student who shows up late with a stained and wrinkled coat, who yells at nurses and tries to recite all of Harrison’s while being unable to form a differential for chest pain. Terrible. Don’t be that student! Follow these ten steps and you will find yourself on the road to a successful clinical experience. This particular article was a wake-up signal for me.